I made you some Maple Coconut Popcorn! Popcorn is one of my girls’ favorite snacks. Ever since we got our air popper , it’s been super easy to make too! Normally, I just make a maple cinnamon version. However, the other day, I had some leftover toasted coconut from my toasted coconut vanilla smoothie, so I added that to the mix. Wow! This Maple Coconut Popcorn came out so delicious! So good that I had to share with all of you. My kids claim to hate coconut, but they tore this up. Not a single bit leftover. I hope you enjoy it too! If you don’t have an air popper, you can also pop this on the stove. To make this on the stove, Just heat a large stock pot with a little coconut oil, drop 1 kernel in to test. Cover the pot. 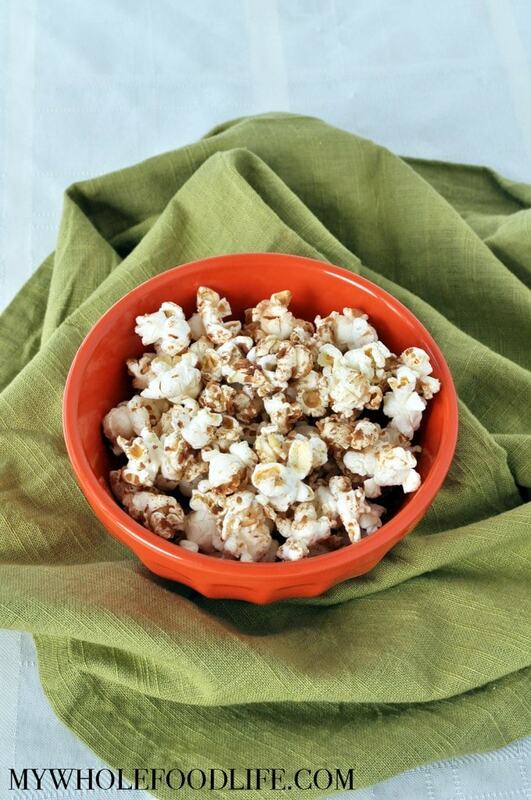 When that one pops, you are ready to add the rest of the kernels. Shake continuously until all the popcorn has popped. Transfer popcorn to a bowl and add in the remaining ingredients. A simple snack for hungry kids! Place the coconut on a lined baking sheet and bake for 3-5 minutes. Just enough to get it toasty. Keep a close eye as every oven is different. Place the kernels into an air popper and turn on. Make sure you have a large bowl to collect the popcorn as it comes out. Once all the kernels are popped, add the remaining ingredients to the bowl and stir well. For best results, eat immediately. Maple coconut sounds like a winning flavor combo! Thanks for including the stovetop version of directions :) I don't think I'd have any place to put another appliance in my tiny kitchen so getting an air popper is not an option at the moment. Are you using sweetened coconut? I made this for snack today and we loved it. My two year old is a popcorn eating machine but since we usually eat ours with Earth Balance, nutritional yeast and sea salt, I wasn't sure if he'd like it. Well, he did and so did my five year old who usually skips snack when we have popcorn. I'll definitely make this again. How can anybody not like coconut! Although if coconut-dislikers loved this then Im sure it'll be one of the best things Ive ever tasted!